One of the many benefits of the Facebook pixel is that you can track and later retarget those who perform specific actions on your website. You can segment your audience in very specific ways based on page views, registrations, purchases, searches, and more. Let’s take a closer look at how and why you should create these audiences. First, I’ll guide you through the basics. In the end, I’ll show you seven specific examples of audiences that you can create. Assuming the Facebook pixel is installed on every page of your website, you can add code to specific pages to capture and track the details of an event (registration, purchase, search, etc.). In addition to the tracking and optimization power of pixel events, you can create audiences of those who performed certain events on your website for highly relevant Facebook ad targeting. If you aren’t using the pixel — or you’re using the pixel, but without events — you’ll be limited regarding the types of pixel event-related audiences that you can create. If you use a certain integration or tag manager (WooCommerce, Shopify, Google Tag Manager, etc. ), click that option. Otherwise, click to manually install the code yourself. The first step is installing the pixel. Facebook does a very good job of explaining how to do this. Make sure the base pixel code goes between the HEAD tags of every page of your website. The second step is to add your events. Facebook has improved their documentation here to streamline this for you. 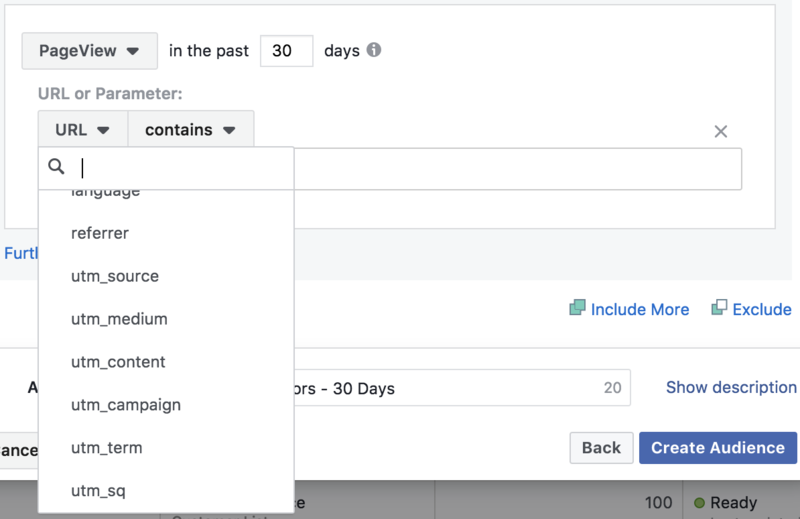 Simply click the button by one of the events and enter the details (for a specific product, for example), and Facebook will spit out the event code that you will add. Instead of manually adding this code, you may also want to install a WordPress plugin. Pixel Caffeine is a free WordPress plugin that I use. 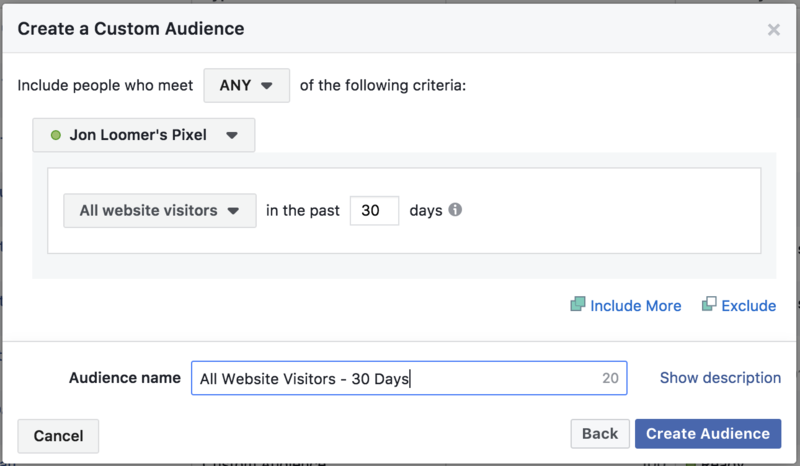 Assuming you are using the pixel and events on your website, you can now do some pretty cool things with Website Custom Audiences. What events appear here will depend upon the events used and found on your website. After selecting an event, you’ll see a link to “refine by” with the first option of “URL/Parameter.” Refining by a parameter will make special use of your events. Parameters are the things that provide details of an event. For a purchase, parameters can include things like the value, currency, and number of items. 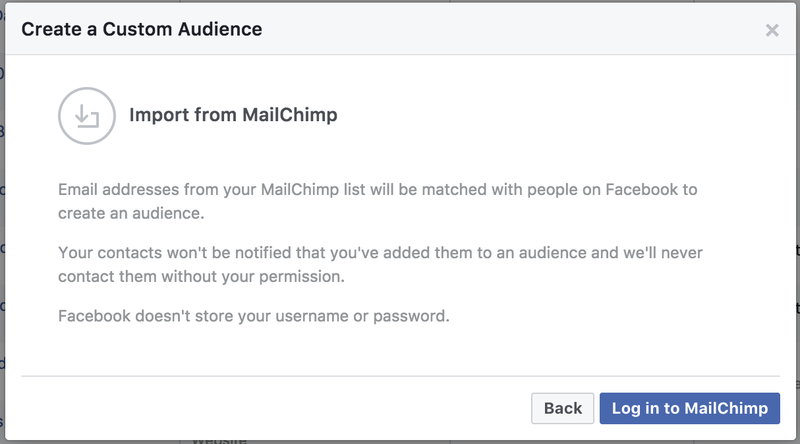 With this option, you can create audiences of people who performed a certain action multiple times. For example, an audience could be created for those who come back multiple times to make purchases totaling more than $1,000 in aggregate. Let’s start generally. My website has multiple ways that you can register for something (two different webinars, two different video series, newsletter, and a Quick Video Tutorials subscription). I can (and do) create individual audiences for all of those actions. But I could also create an audience of all people who registered on my website. This is especially useful for websites that don’t get significant volume for a single lead magnet, but there are several ways to register on the site. Once again, I offer several products on my website. I create audiences for each product, but I can also create an audience of all who have purchased anything on my website. This is one of the most valuable audiences that you can create. This allows me to target those who have viewed the most pages on my website — in aggregate. When people use the Search function on your website, they are looking for answers. This can be valuable information. By creating audiences based on searches, you can create ads targeting these people, promoting the solution. In the example above, people came to my website searching for “pixel.” I can target them when promoting my Facebook pixel 4-week training program. This is just scratching the surface. 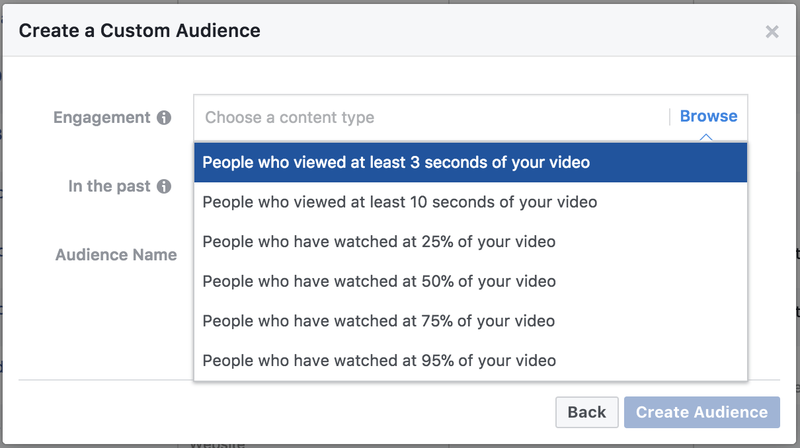 There are dozens and dozens of audiences that you can create based on activity on your Facebook pixel. But this should help you understand the types of audiences that are possible. Have you started creating these? What are examples of some that you use? 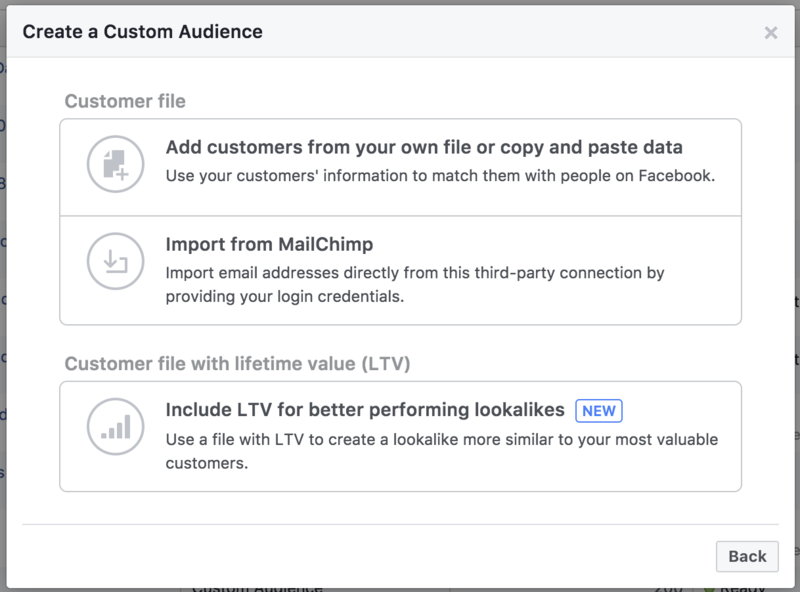 The post Facebook Website Custom Audiences Based on Pixel Events appeared first on Jon Loomer Digital. In June, I started a free webinar series for beginner, intermediate and advanced advertisers. The goal was to segment these groups so that I could offer each registrant a more relevant product (either my Power Hitters Club for advanced marketers or one of my 4-week training programs for beginners or intermediates). This has been a fun experiment for me, and it’s fallen mostly on the down-low for the first few months. For now, I still don’t even have a public facing landing page for my training programs. Until the kinks are worked out of my process, I’ve focused only on remarketing to the groups who sign up for these webinars. This has become a a nifty little funnel for me. As it currently stands, I conduct all three free webinars (always live, but the content changes very little) on the final Monday of each month. I then have a week to promote the relevant training program before the four weeks of training begins the following Tuesday. Until August 5, I relied entirely on organic methods to promote this series (as I type, ads don’t yet exist for the 4-week training programs). But after a modest start, I now commit a few hundred dollars per day to webinar promotion. In order to do this, I need to expand my targeted audience beyond my website visitors. Those who know me realize this is uncomfortable territory. I don’t enjoy targeting people who aren’t connected to me. But I saw this as a challenge and an experiment to multiply my spend. Early results tell me that a registration is worth $6. That’s a very conservative value given that this was prior to major promotion began and prior to the existence of landing pages for my training program products (only checkout pages). But equipped with the framework of a $6 registration value, I knew that I could move beyond targeting only my website visitors (who routinely register for $.50 to $1.00) and venture into the uncomfortable waters of Lookalike Audiences (who will undoubtedly cost more). I don’t have lots of faith in Lookalike Audiences, but I prefer targeting people similar to some key audiences rather than picking and choosing interests. And given the large sizes of these audiences, I also know that there is built in potential to scale, and it’s less likely to over-market even if I spend upwards of $500 per day. I thought you may want to get a look behind the curtain at how I’m promoting my webinar series. I’m constantly tweaking and experimenting, so it’s by no means a finished process. While I’ll continue to find ways to optimize, it may provide some inspiration for your own promotions. Facebook carousel ads can now include up to 10 images or videos. I’m able to take advantage of that for the purpose of promoting recent blog posts. I know that few advertisers promote content for the purpose of driving website traffic only. I find that to be foolish and short-sighted. I have two primary goals with this. The first is to build my most active Website Custom Audiences because I’ll be targeting them later in this process. The second goal is to leverage Instant Article traffic driven on mobile devices. I’ve placed my own ads on my Instant Articles, which are all focused on promoting my webinars. I may need to write an entire tutorial on customizing ads for your Instant Articles (not to mention a tutorial for setting up Instant Articles). In the meantime, read this. I’m experimenting with four different audiences, three of which are my most active website visitors. As you might imagine, the first three are very effective, but the volume I can get is limited given they include my most active visitors only. So I also wanted to expand these audiences. If you haven’t already, make sure you start creating Website Custom Audiences based on frequency and time on your website. They are awesome! The goals here are nearly identical to the ads above. In this case, though, promoting my latest blog post also happens to be part of my normal routine. I’m trying to drive traffic to build my engaged WCA traffic as well as Instant Article traffic from mobile. Unlike the ads above, I focus only on my engaged audience here. With a carousel ad, I can target a broader audience, hoping that at least one post will appeal to someone who doesn’t know me. But while promoting my latest post, I prefer to focus on warm audiences. I chose a happy medium between anyone who visited my website and those who are most active on my website here in an effort to boost the potential audience size while cutting out one-time visitors. Here, I’m targeting anyone who visited at least twice during the past 180 days. This gives me a potential reach of 140,000 people. If you haven’t taken my 30-question Facebook ads quiz, make sure you do so. You’ll quickly see just how much you know! The primary goal here is to get people to take the quiz. Immediately after taking the quiz, the user will get a recommendation for one of my three webinars based on their results. Taking the quiz will lead to more people signing up for an appropriate level webinar. Even if they don’t immediately sign up for the webinar, these people again fall into remarketing. Based on testing, I’ve decided to focus only on my most active website visitors. Lookalikes simply weren’t worthwhile. It makes sense, really. I’m not getting an email address, but I’m asking the user to do something that takes lots of effort. It needs to be a highly engaged user who knows me. In each case, I’m combining two different Website Custom Audiences, one based on frequency and one based on time spent. You may be surprised to know that currently the most efficient audience is the 25% + 1 frequency audience. I use a 10-day window in an effort to avoid overmarketing the audience. My assumption is that the people who are most active on my website during the past 10 days aren’t all that likely to consistently be the most active people. I have no proof of that, but I’m hoping there isn’t a ton of overlap. By limiting the window to 10 days, I can hope to keep this ad relatively evergreen and limit ad impression frequency. Combined with using Daily Unique Reach bidding, I’ve done reasonably well at that. Even though these are small audiences, frequency over 14 days is no more than 4. I this case, I only want to pay to show the quiz to people who are new to the funnel. The exclusions I use to assure this are a bit ridiculous — and probably overkill. I exclude every possible Website Custom Audience, Email Custom Audience and Lead Ad Custom Audience associated with those groups to make sure they are cut out — a total of 54 excluded audiences. The first set of ads created for the purpose of driving signups for my webinars are remarketing plays. Not surprisingly, my goal here is to get more webinar registrations. But I also want it to be rather evergreen. You’ll notice that I don’t mention dates. That will be updated on the landing page. I do this with the second set of ads as well. I took a few different approaches here. First, I did an abandoned page, targeting those who previously visited the landing page for that webinar. Second, I targeted anyone who registered for the beginner webinar during the past 30-60 days to promote the intermediate webinar. I also did the same thing for those who registered for the intermediate webinar for promoting the advanced one. Here, I exclude anyone who registered for the webinar I’m promoting as well as the 4-week program for the same level. I also exclude anyone who participated in anything that is a higher level. For example, if promoting the intermediate webinar to those who attended the beginner webinar, I’ll also exclude those who attended the advanced webinar. I could also use a carousel to promote my webinars. The goal is to get webinar registrations, but this time it’s to get volume. While the approach above will lead to inexpensive registrations, potential for volume is very limited. For the 10% audience, I’m also experimenting with dayparting. I researched my ad reports to find the most efficient hours of the day to get a conversion during 2016. I’m also experimenting with an audience that knows me very well, but creating variations of the targeting. I combined those who visited 3+ times or were in the top 5% of my most active visitors during the past 10 days. In one case, I let Facebook optimize. In the other, I expand the net a bit by using Daily Unique Reach. On the surface, this is a lot like what we did above with individual webinar ads. However, in this case, I am mentioning the date. That’s because each lead ad form is date specific, so I create special ads for them. Get registrations. You know that! But I like to split test vs. sending to a landing page to make sure I’m doing it most efficiently. To avoid overmarketing, I’m not doing the exact same targeting as above. The audiences and targeting are very modest for this campaign. In the first ad set, I combined the various Lookalikes instead of splitting them out this time. I also used Lookalikes only for beginners since I find that webinar to be valuable due to the potential to send them through multiple products. As mentioned, these ads are date specific. So I’ve actually created forms and ads in preparations for future runs as well. It’s possible I may be a bit obsessed! Once the landing pages are ready for my 4-week training programs, there is a logical next step. I will then run Facebook ads promoting each program based on the webinar someone attended. These ads will make my email campaigns more effective and vice versa. Keep in mind that I’m leaving a lot of details out here, but this is a good start. I should have close to 10,000 total registrations for the next webinars on Monday, and a big reason for that is these campaigns. Hopefully my process will provide some inspiration for your own campaigns. Any other approaches you’d take? Let me know in the comments below! The post How I’m Promoting My Webinar Series with Facebook Ads appeared first on Jon Loomer Digital.